Assigned status Up to Date by Sarwat Salim MD, FACS on May 7, 2015. Since the introduction of the first glaucoma drainage device, Molteno implant, various modifications of the original design and improvements in surgical techniques over the past 40 years have led to greater success and lower complication rates. In addition, other glaucoma drainage devices have been introduced and offer unique features designed to facilitate implantation, improve IOP control, and reduce acute postoperative hypotony. Currently, the glaucoma drainage devices are available in different sizes, materials, and design with the presence or absence of an IOP regulating valve. The nonvalved devices include the Molteno (IOP, Inc., Costa Mesa, CA, USA, and Molteno Ophthalmic Limited, Dunedin, New Zealand), Baerveldt (Advanced Medical Optics, Inc., Santa Ana, CA, USA), Shocket, and Eagle Vision implants (Eagle Vision, Inc. Memphis, TN, USA). Unlike the nonvalved devices, the valved or flow-restrictive devices allow only unidirectional flow from the anterior chamber to the subconjunctival space with a minimum opening pressure. 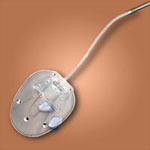 The most commonly used valved implant is the Ahmed glaucoma valve, AGV (New World Medical, Rancho Cucamonga, CA, USA). Table 1 provides a summary of commercially available devices with their respective characteristics. This review article will discuss the currently available glaucoma drainage devices, preoperative considerations and surgical technique, description and management of various complications, surgical outcomes in refractory glaucomas, comparative studies of various glaucoma drainage devices, and comparative studies of glaucoma drainage devices and trabeculectomy. Glaucoma drainage devices are typically reserved for patients with severe uncontrolled glaucoma who have failed previous glaucoma surgery. In addition, the devices appear to be advantageous as a primary procedure in patients with a high likelihood of trabeculectomy failure, including neovascular and uveitic glaucomas      . They are commonly used in the management of congenital and developmental glaucomas. Additional indications include traumatic glaucoma, aphakic and pseudophakic glaucoma, post-keratoplasty glaucoma, and other secondary glaucomas . Recently, interest has increased in using these devices as a primary surgical procedure for uncontrolled primary open-angle glaucoma. Careful preoperative examination and planning are essential for successful surgical outcomes. Clinicians should assess mobility of the conjunctiva to determine the best quadrant for drainage implant insertion. The iris should be inspected under high magnification to detect neovascularization to consider preoperative use of anti-vascular endothelial growth factor (VEGF) agents to minimize intraoperative and postoperative bleeding. Anterior chamber depth should be assessed to determine if tube insertion in the anterior chamber would be safe without touching the iris or cornea. Gonioscopy should be performed preoperatively to determine the locations of peripheral anterior synechiae which may interfere with the tube insertion into the anterior chamber intraoperatively. The lenticular status of the eye should be noted. The tube may be placed in the sulcus in a pseudophakic eye or pars plana in an aphakic, vitrectomized eye. In an eye with a cataract, a combined surgery may be considered. For a beginning surgeon, valved devices may be preferred as the surgical technique is simpler with localization to one quadrant without manipulation of the adjacent rectus muscles. IOP control in the early postoperative period is more predictable with these devices because of flow-restricting mechanisms. In patients with poor compliance with postoperative medication use and follow-up visits, valved implants may be preferred because they usually require less postoperative follow-up and care. The amount of conjunctival scarring may determine the size of the implant and available area for a single-plate versus double-plate device. The most important factor determining the type of implant selected is the target IOP, both in the short-run and long-run. Early IOP control is determined by the presence or absence of a valve in an implant, as the tube offers no resistance to aqueous flow. The valved devices provide more immediate IOP control and a lower rate of hypotony. Because nonvalved devices are often occluded with a stent or ligature suture, the postoperative IOP is unchanged and requires continuation of all preoperative medications until the fibrous capsule forms. With all devices, long-term IOP control depends on the surface area of the implant, which determines bleb size, tissue response to the implant, and thickness of the fibrous capsule controlling percolation of aqueous humor through the bleb wall. Plate material has been studied in various studies to determine its influence on final IOP, as it may affect tissue reaction and the degree of bleb encapsulation. Ayyala et al. demonstrated more inflammation with the polypropylene plate (Molteno implant) than with the silicone plate (Krupin implant) when inserted subconjunctivally in rabbits. Two retrospective studies compared AGV silicone (model FP7) and polypropylene (model S2) and reported similar results with both models in terms of IOP control, final visual acuity, and postoperative antiglaucoma medications . In one of these studies, the silicone valve was associated with fewer serious complications . The AGV silicone and polypropylene material has also been investigated in a prospective, multicenter, comparative series, which reported improved final IOP control with the silicone model compared with the polypropylene model . The investigators observed more Tenon’s cysts in the polypropylene group. Plate size of various implants has been investigated to determine its influence on the final IOP. Heuer et al. reported improved IOP control with the Molteno double-plate when compared with the single-plate in a prospective study assessing outcomes in aphakic and pseudophakic glaucoma. In a retrospective study, the double-plate Molteno demonstrated lower mean IOP when compared with the single-plate AGV, 13.3 ± 5.1 mm Hg vs. 19 ± 5.8 mm Hg (P=0.009), respectively, at 24 months . In a prospective study comparing 350-mm2 and 500-mm2 Baerveldt implants, Lloyd et al. reported statistically comparable results with respect to IOP control, visual acuity, and complications. In another prospective study comparing 350-mm2 and 500-mm2 Baerveldt implants, Britt et al. found better IOP control with the 350-mm2 Baerveldt implant than with the 500-mm2 model. These studies indicate that size of the implant does matter, but to a limited extent. Further studies are warranted to determine which one of these variables- size, shape, or composition is most likely to affect long-term success of glaucoma drainage devices. Implantation of a glaucoma drainage device requires careful attention to detail at every step of the procedure to improve results and minimize postoperative complications. Initially, a fornix-based or limbus-based conjunctival incision is created to allow adequate exposure for insertion of the plate. A corneal or scleral suture can be placed to improve exposure in the working quadrant. The implant is anchored between two rectus muscles with the anterior edge approximately 8 to 10 mm posterior to the limbus. Larger implants (Baerveldt) are inserted with the long axis directed toward the apex of the orbit and then rotated hori¬zontally so that the tube points directly toward the anterior chamber and the wings of the implant are under the rectus muscles. If a two plate implant is used, one plate is positioned in each of two quadrants. The tube connecting the two plates may be passed under or over the intervening rectus muscle. With all valved implants, prior to the plate anchorage, the tube should be primed with balanced salt solution with a 30-gauge cannula to ensure that the valve leaflets are not fused after sterilization techniques. The tube of the nonvalved implant should be irrigated as well to ensure its patency. After the plate is attached to the globe, the tube is laid across the cornea and cut with a sharp scissors to create a beveled edge with the opening toward the cornea. The tube should extend approximately 2.5 to 3 mm into the anterior chamber to minimize the risk of tube-cornea touch or retraction out of the anterior chamber. A 23-gauge needle is used to create a track through which the tube is inserted into the anterior chamber just anterior and parallel to the iris. The tube may be secured to the sclera a few millimeters anterior to the plate with 7- 0 or 8-0 Vicryl suture. This suture helps to stabilize the tube and should not be tight; otherwise, it will restrict flow in valved devices. The tube is covered to prevent its erosion through the conjunctiva. Patch graft materials include processed pericardium, sclera, fascia lata, dura, or cornea. The patch graft should be secured to the globe with interrupted sutures at the anterior corners by using either 8-0 Vicryl or nylon sutures. If the patch graft material is not available, a partial thickness scleral flap can be constructed. The needle track and tube entry are done under this flap. The flap is then sutured with 10-0 nylon sutures. After the patch graft has been placed, the conjunctiva and Tenon layers are pulled over the plate, tube, and patch graft and secured into place with 8-0 Vicryl suture. In some cases, the monofilament 9-0 Vicryl suture is preferred because of its higher tensile strength and finer vascular needle to prevent buttonholes when handling thin conjunctiva. At the end of the operation, the eye should be inspected to ensure that the implant plate, patch graft, and intraocular portion of the tube are in good position. Fluorescein drops or strips can be used to inspect the conjunctiva for leaks. Any buttonholes found in the conjunctiva should be closed with 9-0 Vicryl suture. At the conclusion of the procedure, a subconjunctival injection of antibiotic and steroid is given. Internal Tube Occlusion (Stent) Aqueous drainage through a nonvalved device can be regulated in the early postoperative period by passing a 4-0 or 5-0 Prolene or nylon suture through the lumen of the implant. Once the fibrous capsule around the plate has formed, the stent suture is removed at the slit lamp under local anesthesia. The flow of aqueous humor through a nonvalved device can also be restricted by placing a suture ligature around the external aspect of the tube. The external occlusion may be accomplished using a non-absorbable 7-0 suture with a releasable knot or a 7-0 or 8-0 absorbable Vicryl suture tied around the tube. Alternatively, 9-0 nylon or 10-0 Prolene suture may be used to ligate the tube inside the anterior chamber to allow for later suture lysis with the argon laser. Some surgeons create venting slits anterior to the ligature suture with either a needle or a knife for aqueous drainage, thereby allowing immediate IOP control in the early postoperative period. To prevent postoperative hypotony, a shunt procedure may be performed in two stages. In the first stage, the plate is attached to the globe and the tube is left in the subconjunctival space without entering the eye. Four to 6 weeks later, after a capsule has formed around the implant, the conjunctiva is opened and the tube is inserted into the anterior chamber to complete the procedure. The tube of the glaucoma drainage device is most commonly placed in the anterior chamber. However, the tube may also be placed in the sulcus in a pseudophakic eye or in the pars plana in a vitrectomized eye. This procedure can be accomplished using one of two options: a Pars Plana Clip (Model PC, New World Medical, Inc., Rancho Cucamonga, CA, USA), which can be used with any drainage device or Hoffman elbow, which is mounted on a Baerveldt 350-mm2 implant (Advanced Medical Optics, Inc., Santa Ana, CA, USA). With the exception of the two-plate implants, most glaucoma implants are placed in a single quadrant. Whenever possible, single-plate implants should be placed in the supero-temporal quadrant. This area provides the easiest access for the surgeon to implant the plate and is least likely to produce motility disturbances. Implantation of a large plate aqueous shunt in the supero-nasal quadrant has been associated with Brown's superior oblique tendon syndrome . Substantial hypertropias and limitations of down gaze have been reported with inferior implantation of two-plate Molteno and the Krupin valve with disc . In eyes containing silicone oil, the implant is placed in the inferior quadrant to minimize loss of oil, which is lighter than aqueous and floats up. Using anti-metabolites with improved success in trabeculectomy led to considerable interest in using these agents with glaucoma drainage devices. One early study indicated that patients receiving mitomycin C at the time of glaucoma implant surgery had lower final IOP, required fewer post-operative medications, and had less pronounced hypertensive phases; however, the duration of the post-operative hypotensive phase was prolonged and was associated with an increase in choroidal effusions, flat anterior chambers, and other post-operative complications . However, subsequent studies have not shown these agents to be effective. Two retrospective studies reported no benefit of intraoperative use of mitomycin C with Baerveldt implants . Two prospective randomized trials studied the effectiveness of intraoperative use of mitomycin C with Molteno and AGV implantation. Neither trial demonstrated higher success rates with intraoperative mitomycin C in terms of final IOP, visual acuity, and number of antiglaucoma medications required postoperatively  . As a result of these investigations, antifibrosis agents are not currently used with glaucoma drainage devices. Following glaucoma drainage implant surgery, the patient is seen on postoperative day 1, and attention is paid to the tube position and wound architecture. A topical antibiotic and steroid are started four times daily and continued for 4 to 6 weeks. Initial follow-up is at 1 week, and the frequency of visits depends on the clinical status of the eye. For valved implants, preoperative glaucoma medications are discontinued to prevent hypotony. For nonvalved implants, the glaucoma medications are usually continued until a fibrous capsule forms around the plate, at which point the ligature suture may spontaneously open. If further IOP lowering is required, the stent can also be removed. Glaucoma drainage devices can be associated with various postoperative complications. The early postoperative complications are similar to other filtration procedures including flat chambers, hypotony, and suprachoroidal hemorrhage . Hypotony and its related sequelae, choroidal effusions or suprachoroidal hemorrhage, are more commonly observed with the nonvalved drainage devices. Early postoperative hypotony usually results from wound leak, inflammation, incomplete occlusion of the tube, or larger venting slits with nonvalved implants. Valved implants usually reduce, but do not eliminate hypotony. Hypotonous eyes are conservatively managed as long as the anterior chamber depth is maintained. If there is lenticular-corneal touch, then a viscoelastic should be injected to reform the anterior chamber. Associated choroidal effusions are generally treated with corticosteroid and cycloplegic agents. If these measures fail, surgical revision may be required. This is a rare complication. All valved devices should be primed at the time of the surgery as sterilization techniques may lead to adhesion of the valve membranes that prevents flow to the plate . In addition, careful surgical handling during insertion is required to prevent damage to the plastic rivets holding the valve . Hyphema may occur following procedures performed on eyes with neovascular glaucoma. It is seen less commonly now with the preoperative use of anti-VEGF agents. Scleral perforation is a rare complication during anchorage of the plate to the sclera. Care must be taken in buphthalmic eyes and eyes with collagen vascular diseases. Care should be taken to place the tube in the anterior chamber correctly. If the tube is placed too anteriorly, it will cause decompensation of the corneal endothelium. If the tube is placed too posteriorly, it will cause inflammation by rubbing on the iris and may also result in cataract formation if it touches the anterior lens capsule. If the tube is inadvertently cut too short, either an angiocatheter or tube extender can be used to obtain the desired length . Tube block from blood, vitreous, fibrin, or iris incarceration in the early postoperative period can occur. A Nd:YAG laser may be helpful in some cases , whereas in others, a return trip to the operating room to clear the tube end may be required, especially in eyes with retained vitreous that may necessitate vitrectomy. If the tube is clogged by a blood clot, tissue plasminogen activator (0.1-0.2 ml of 5-20 µg) may be beneficial to dissolve the clot. Tube obstruction because of kinking of the tube has been reported after pars plana AGV insertion . The obstruction was treated with a pars plana clip. Tube retraction and anterior migration are more commonly seen in children. As the eye grows, the tube may retract or touch the corneal endothelium. Retracted tubes can be lengthened with tube extenders or, alternatively, can be placed in the pars plana. Anterior migration of the tube can be fixed by shortening its length and a more posterior reinsertion. Tube erosion usually results from conjunctival melting near the limbus overlying the tube and may be related to poor patch graft preparation or placement; however, even without these factors, melting of the conjunctiva and patch graft occur over time and result in tube exposure. Replacing the patch graft and mobilizing a conjunctival graft may be useful in repairing these defects. An exposed tube or plate is considered an ocular emergency requiring prompt surgical intervention to prevent endophthalmitis. The risk of endophthalmitis has been reported to be more common in children . These are seen less commonly than are tube migration and tube erosion. Migration and expulsion usually result from placing the plate too anteriorly. Poor tube placement with lens-cornea touch or persistent flat chamber from hypotony may result in corneal edema. In eyes that have undergone penetrating keratoplasty, the risk of graft failure in eyes that develop a flat chamber postoperatively is high . The use of valved and stented implants that better maintain the anterior chamber depth reduces this complication. Alternatively, placing the tube in pars plana helps to avoid corneal or graft decompensation. If the patch graft is too thick or the plate is too anterior, an overhanging bleb may be created resulting in chronic Dellen formation and ocular irritation. This complication is best prevented by appropriate plate and patch graft placement during surgery. Extraocular muscle imbalance with devastating diplopia may also occur and is particularly common in cases of inferior implant placement. This imbalance usually results from a mass effect of the plate and the surrounding bleb on adjacent extraocular muscles. Other possible causes include Faden or posterior fixation suture effect induced by scarring under the rectus muscles, entrapment of superior oblique muscle or fat fibrosis syndrome because of inadvertent manipulation of orbital fat , or a pseudo-Brown’s syndrome from supero-nasal insertion of drainage devices . Diplopia secondary to drainage devices is difficult to treat and various treatment options include prisms, muscle surgery, or even removal of the drainage implant. Hypertensive phase is characterized by elevated IOP, typically in 30- to 50- mm Hg range, occurring anywhere between 1 and 6 weeks postoperatively. This condition has been reported after inserting all types of drainage devices, but more common with valved implants . In eyes with hypertensive phase, the tube does not appear to be occluded by any of the methods described above, and elevated IOP is presumably secondary to a thick-walled bleb over the plate of the implant, which decrease permeability of the aqueous humor through the conjunctiva. Treatment options for hypertensive phase include medical therapy, digital massage, bleb needling with or without 5-fluorouracil, and possible surgical excision of the bleb . When all these measures fail, a second drainage implant or cyclodestructive procedure may be considered. Glaucoma drainage devices have been shown to provide effective IOP control in eyes that have failed prior surgery or have a poor prognosis for standard filtration surgery . At 2 years of follow-up, most studies indicated overall success rates of 50% to 80% with the outcome depending on the type of glaucoma present and type of implant selected. 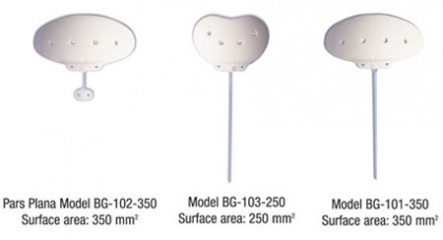 A few retrospective studies have compared clinical outcomes of AGV versus Baerveldt implants . Of these, the larger series  consisted of 118 eyes with a follow-up of 48 months, at which time the final success in terms of IOP control was reported to be comparable in both groups: 62% for the Ahmed group and 64% for the Baerveldt group (P=0.84). The postoperative complications differed in the two groups, with hypotony-related issues in the Baerveldt group and hypertensive crisis in the Ahmed group requiring antiglaucoma medications . These studies had limitations given their retrospective designs in that the study groups were not similar: the eyes undergoing Ahmed valve implantation had higher preoperative IOP in one study , and the mean age at implantation was significantly different in another study, although this study found a higher success rate with Baerveldt than with Ahmed: 83% versus 67%, respectively, at 42 months . Double-plate Molteno was compared to AGV in a retrospective, case control study with 30 subjects in each arm . At 24 months follow-up, mean IOP was 13.3 ± 5.1 mm Hg in the Molteno group and 19.0 ± 5.8 mm Hg in the AGV group (P=0.009). This study also reported a high incidence of postoperative hypotony in the nonvalved group and hypertensive crisis in the valved group. The Ahmed Baerveldt Comparison Study (ABC) is a multicenter, randomized, prospective clinical trial that recently completed recruitment. The preliminary results of this trial were presented at the annual meeting of American Glaucoma Society in Naples, FL, March 4-5, 2010 . Two hundred and seventy-six subjects with uncontrolled glaucoma received either an AGV (model FP7) or a Baerveldt implant (model 350 mm2). The majority of the recruited subjects had either primary open-angle glaucoma or neovascular glaucoma. Forty-two percent of the subjects had previously failed trabeculectomy. The mean baseline IOP was 30 mm Hg. Failure was defined as an IOP greater than 21 mm Hg and less than 6 mm Hg, less than 20% IOP reduction from baseline, repeat surgery, or loss of light perception. At 1 year, the mean IOP was 15.4± 5.5 mm Hg in the Ahmed group and 13.2± 6.8 mm Hg in the Baerveldt group (P=.007). The cumulative probability of failure was 16.4% and 12.3% in the AGV and Baerveldt groups, respectively. The Baerveldt group required more surgical interventions postoperatively. Using different models in controlling IOP in eyes with neovascular glaucoma, Sidoti et al. assessed the effectiveness of the Baerveldt implant. The life-table success rates were 79% and 56% at 12 and 18 months, respectively. Although there were no significant differences noted between various models in terms of percentage of postoperative IOP reduction or complication rates, the postoperative visual loss was reported to be common in these eyes as a result of underlying disease. In another study, IOP control was reported to be adequate to keep the eyes comfortable, but the visual outcome of patients with neovascular glaucoma was determined primarily by underlying disease process with diabetic patients doing significantly better than did patients with a central retinal vein occlusion . Both AGV and Baerveldt implants have been shown to be effective in controlling IOP in uveitic eyes . In a retrospective, noncomparative case series, Da Mata et al. reported a cumulative probability of success of 94% at 1 year after AGV implant. In this series, all patients had uveitis controlled prior to surgery with immunomodulatory therapy, which may have contributed to the high success rate. Using different models of Baerveldt implant, Ceballos et al. reported a similar cumulative life-table success rate of 91.7% at 24 months. The AGV implant was found to be moderately successful when long-term results were reported for eyes with uveitic glaucoma . The qualified success rates were 57% and 39% at 1 and 4 years, respectively. At 4 years, 74% of the patients required adjunctive glaucoma therapy to control IOP. The Ahmed glaucoma valve was shown to be very effective in treating medically uncontrolled IOP after pars plana vitrectomy and silicone oil injection for complicated retinal detachments. IOP was reduced from a mean of 44± 11.8 mm Hg before surgery to 14± 4.2 mm Hg at the most recent follow-up after surgery (P<0.001). The number of glaucoma medications reduced after surgery was also statistically significant . Coleman et al. reported clinical outcomes of AGV in eyes with prior or concurrent penetrating keratoplasty. The cumulative probabilities of success at 12 and 20 months were 75.4% ± 8.2% and 51.5% ± 11.4%, respectively. Ayyala et al. compared trabeculectomy with mitomycin C, glaucoma drainage device implantation with both valved and nonvalved implants, and Nd:YAG cyclophotocoagulation laser to manage intractable glaucoma after penetrating keratoplasty. No differences were found among the three glaucoma procedures in terms of final IOP control and graft failure. The laser-treated group tended to have higher incidence of graft failure, glaucoma failure, and loss of vision, but these results were not statistically significant. Glaucoma drainage devices have also been reported to be effective in glaucoma associated with keratoprosthesis . Glaucoma drainage devices are increasingly being used in pediatric glaucoma which is often refractory to conventional medical and surgical therapy . Billson et al. reported favorable outcomes in developmental glaucomas using two-stage implantation of the Molteno implant where final IOP with adjunctive glaucoma medications was less than 21 mm Hg in 78% of the cases. Coleman et al. evaluated AGV in pediatric glaucoma cases and reported cumulative probabilities of success at 12 and 24 months to be 77.9% ± 8.8% and 60.6% ± 13.7%, respectively. Englert et al. reported AGV to be effective in refractory pediatric glaucoma cases, even in eyes with previous cycloablative procedures. Budenz et al. evaluated the Baerveldt implant in childhood glaucoma associated with Sturge-Weber syndrome. They concluded that two-stage Baerveldt surgery was both effective and safe in these children. At average follow-up of 35 months, all 10 eyes had IOP less than 21 mm Hg on medications without the need for additional glaucoma surgery. Wilson et al. compared short and intermediate results of trabeculectomy and AGV in a randomized clinical trial and reported statistically lower mean IOP with trabeculectomy than with AGV at weeks 6-15 and months 11-13. The cumulative probability of success was 83.6% for the trabeculectomy group and 88.1% for the AGV (P=0.43). There was no significant difference in complication rates between the two groups, but the AGV group required more glaucoma medications postoperatively. The same investigators subsequently reported the long-term results of these two procedures . The cumulative probabilities of success at months 41-52 were 68.1% for the trabeculectomy group and 69.8% for the AGV group (P= 0.86). Adjunctive medication requirement was also comparable in both groups with longer follow-up. Gedde et al. have been investigating the clinical outcomes of nonvalved tube shunt, specifically the Baerveldt 350 mm2, and standard trabeculectomy with mitomycin C in a multicenter, randomized clinical trial. A total of 212 eyes were enrolled with IOP ≥ 18 mm Hg and ≤ 40 mm Hg. The main outcome measures were IOP, visual acuity, and reoperation for glaucoma. At 1 year follow-up, IOP control was good in both groups, with slightly lower pressures in the Baerveldt group. The mean IOP was 12.7± 3.9 mm Hg in the trabeculectomy group and 12.4± 3.9 mm Hg in the Baerveldt group (P=0.73). The cumulative probability of failure during the first year was 3.9% in the Baerveldt group and 13.5% in the trabeculectomy group (P=0.17). Intraoperative complications occurred in 7% of the Baerveldt group and 10% of the trabeculectomy group (P=.59). Postoperative complications were more common in the trabeculectomy group than in the Baerveldt group, 57% versus 34%, respectively. Adjunctive glaucoma medications were required more in the Baerveldt group. Longer follow-up of this study will elucidate further details on IOP control and other variables with these two commonly performed glaucoma surgeries. Glaucoma drainage devices have been successful in controlling IOP in eyes with previously failed trabeculectomy and difficult glaucomas. Since their introduction over 40 years ago, numerous modifications in design and improvements in surgical technique have enhanced clinical outcomes and minimized complications. These devices are available in different sizes, materials, and design. The decision to choose a particular type of drainage device depends on a patient’s underlying characteristics in terms of preoperative IOP and optic nerve status, desired long-term IOP control, and the surgeon’s comfort and preference. Careful preoperative screening and planning along with meticulous surgical technique help minimize postoperative complications. The ongoing tube vs. trabeculectomy and Ahmed Baerveldt Comparison (ABC) studies will provide further information with respect to long-term IOP control achieved with these devices when compared with glaucoma filtration surgery and between valved and nonvalved devices, respectively. American Academy of Ophthalmology. Pediatric Ophthalmology/Strabismus: Glaucoma drainage devices Practicing Ophthalmologists Learning System, 2017 - 2019 San Francisco: American Academy of Ophthalmology, 2017. ↑ 1.0 1.1 Brown RD, Cairns JE. Experience with the Molteno long tube implant. Trans Ophthalmol Soc UK 1983;103:297-312. ↑ 2.0 2.1 2.2 Mermoud A, Salmon JF, Alexander P, et al. Molteno tube implantation for neovascular glaucoma: long term results and factors influencing out¬come. Ophthalmology 1993;100:897-902. ↑ Hill RA, Nguyen QH, Baerveldt G, et al. Trabeculectomy and Molteno implantation for glaucomas associated with uveitis. Ophthalmology 1993;100:903-908. ↑ 4.0 4.1 Sidoti PA, Dunphy TR, Baerveldt G, et al. Experience with the Baerveldt glaucoma implant in treating neovascular glaucoma. Ophthalmology 1995;102:1107-1118. ↑ Da Mata A, Burk SE, Netland PA, et al. Management of uveitic glaucoma with Ahmed glaucoma valve implantation. Opthalmology 1999;106:2168-2172. ↑ Ceballos EM, Parrish RK, Schiffman JC. Outcome of Baerveldt glaucoma drainage implants for the treatment of uveitic glaucoma. Ophthalmology 2002;109:2256-2260. ↑ Papadaki TG, Zacharopoulos IP, Pasquale LR, et al. Long-term results of Ahmed glaucoma valve implantation for uveitic glaucoma. Am J Ophthalmol 2007;144:62-69. Brown RD, Cairns JE. Experience with the Molteno long tube implant. Trans Ophthalmol Soc UK 1983;103:297-312. ↑ Mermoud A, Salmon JF, Alexander P, et al. Molteno tube implantation for neovascular glaucoma: long term results and factors influencing out¬come. Ophthalmology 1993;100:897-902. ↑ Sidoti PA, Dunphy TR, Baerveldt G, et al. Experience with the Baerveldt glaucoma implant in treating neovascular glaucoma. Ophthalmology 1995;102:1107-1118. ↑ 11.0 11.1 11.2 Da Mata A, Burk SE, Netland PA, et al. Management of uveitic glaucoma with Ahmed glaucoma valve implantation. Opthalmology 1999;106:2168-2172. ↑ 12.0 12.1 12.2 Ceballos EM, Parrish RK, Schiffman JC. Outcome of Baerveldt glaucoma drainage implants for the treatment of uveitic glaucoma. Ophthalmology 2002;109:2256-2260. ↑ 13.0 13.1 13.2 Papadaki TG, Zacharopoulos IP, Pasquale LR, et al. Long-term results of Ahmed glaucoma valve implantation for uveitic glaucoma. Am J Ophthalmol 2007;144:62-69. ↑ 14.0 14.1 14.2 Billson F, Thomas R, Aylward W. The use of two-stage molten implants in developmental glaucoma. Journal of Pediatric Ophthalmology and Strabismus 1989;26:3-8. ↑ 15.0 15.1 15.2 Munoz M, Tomey KF, Traverso C, et al. Clinical experience with the Molteno implant in advanced infantile glaucoma. J Ped Ophthalmol Strabismus 1991;28:68-72. ↑ 16.0 16.1 Netland PA, Walton DS. Glaucoma drainage implants in pediatric patients. Ophthalmic Surg 1993;24:723-729. ↑ 17.0 17.1 17.2 Coleman AL, Smyth RJ, Wilson RM, et al. Initial clinical experience with the Ahmed glaucoma valve implant in pediatric patients. Arch Ophthalmol 1997;115:186-191. ↑ 18.0 18.1 Netland PA, Terada H, Dohlman CH. Glaucoma associated with keratoprosthesis. Ophthalmology 1998;105:751-757. ↑ Ayyala RS, Harman LE, Michelini-Norris B, et al. Comparison of different biomaterials for glaucoma drainage devices. Arch Ophthalmol 1999;117:233-236. ↑ Ayyala RS, Michelini-Norris B, Flores A, et al. Comparison of different biomaterials for glaucoma drainage devices: part 2. Arch Ophthalmol 2000;118;1081-1084. ↑ 21.0 21.1 Mackenzie PJ, Schertzer RM, Isbister CM. Comparison of silicone and polypropylene Ahmed glaucoma valves: two-year follow-up. Can J Ophthalmol 2007;42:227-232. ↑ Brasil MVOM, Rockwood EJ, Smith S. Comparison of silicone and polypropylene Ahmed glaucoma valve implants. J Glaucoma 2007;16:36-41. ↑ Ishida K, Netland PA, Costa VP, et al. Comparison of polypropylene and silicone Ahmed glaucoma valves. Ophthalmology 2006;113:1320-1326. ↑ 24.0 24.1 24.2 Heuer DK, Lloyd MA, Abrams DA, et al. Which is better? One or two? A randomized clinical trial of single-plate versus double-plate Molteno implantation for glaucoma in aphakia and pseudophakia. Ophthalmology 1992;99:1512-1519. ↑ 25.0 25.1 Ayyala RS, Zurakowski D, Monshizadeh R, et al. Comparison of double-plate Molteno and Ahmed glaucoma valve in patients with advanced uncontrolled glaucoma. Ophthalmic Surg and Lasers 2002;33:94-101. ↑ 26.0 26.1 26.2 Lloyd MA, Baerveldt G, Fellenbaum PS, et al. Intermediate-term results of a randomized clinical trial of the 350 versus the 500 mm2 Baerveldt implant. Ophthalmology 1994;101:1456-1464. ↑ Britt MT, LaBree LD, Lloyd MA, et al. Randomized clinical trial of the 350-mm2 versus the 500-mm2 Baerveldt implant longer term results. Is bigger better? Ophthalmology 1999;106:2312-2318. ↑ 28.0 28.1 Ball SF, Ellis GS, Herrington RG, et al. Browns superior oblique tendon syndrome after Baerveldt implant. Arch Ophthalmol 1992; 110:1368. ↑ 29.0 29.1 Christman LM, Wilson ME: Motility disturbances after Molteno im¬plants. J Ped Ophthalmol Strabismus 1992;29:44-48. ↑ Gross FJ: Six month success of Krupin valve with and without Mitomy-cin-C in the treatment of complicated glaucomas. Invest Ophthalmol Vis Sci 1994 (Suppl);35:l422. ↑ Trible JR, Brown DB. Occlusive ligature and standardized fenestrations of a Baerveldt tube with and without antimetabolites for early postoperative intraocular pressure control. Ophthalmology 1998;105:2243-2250. ↑ Irak I, Moster MR, Fontanarosa J. Intermediate-term results of Baerveldt tube shunt surgery with mitomycin C use. Ophthalmic Surg Laser and Imaging 2004;35:189-196. ↑ Cantor L, Burgoyne J, Sanders S, et al. The effect of mitomycin C on Molteno implant surgery: A 1-year randomized, masked, prospective study. J Glaucoma 1998;7:240-246. ↑ Costa VP, Azuara-Blanco A, Netland PA, et al. Efficacy and safety of adjunctive mitomycin C during Ahmed glaucoma valve implantation: A prospective randomized clinical trial. Ophthalmology 2004;111:1071-1076. ↑ 35.0 35.1 Molteno ACB: New implant for drainage in glaucoma: clinical trial. Br J Ophthalmol 1979;53:606-615. ↑ Feldman RM, El-Harazi SM, Villanueva G. Valve membrane adhesion as a cause of Ahmed glaucoma valve failure. J Glaucoma 1996;6:10-12. ↑ Hill RA, Pirouzian A, Liaw LH. Pathophysiology of and prophylaxis against late Ahmed glaucoma valve occlusion. Am J Ophthalmol 2000;129:608-612. ↑ Sarkisian SR, Netland PA. Tube extender for revision of glaucoma drainage implants. J Glaucoma 2007;16:637-639. ↑ Tessler Z, Jluchoded S, Rosenthal G. Nd:YAG laser for Ahmed tube shunt occlusion by the posterior capsule. Ophthlamic Surg Lasers 1997;28:69-70. ↑ Netland PA, Schuman S. Management of glaucoma drainage implant tube kink and obstruction with pars plana clip. Ophthalmic Surg Lasers Imaging 2005;36:167-168. ↑ Tarbak AAA, Shahwan SA, Jadaan IA, et al. Endophthalmitis associated with the Ahmed glaucoma valve implant. Br J Ophthalmol 2005;89:454-458. ↑ 42.0 42.1 Beebe WE, Starita RJ, Fellman RL. The use of the Molteno implant and anterior chamber tube shunt to encircling band for the treatment of glaucoma in keratoplasty patients. Ophthalmology 1990;97:1414-22. ↑ Sherwood MB, Smith MF, Driebe WT Jr., et al. Drainage tube implants in the treatment of glaucoma following penetrating keratoplasty. Ophthalmic Surg 1993;24(3):185-189. ↑ McDonell PJ, Robin JB, Schanzlin DJ, et al. Molteno implant for control of glaucoma in eyes after penetrating keratoplasty. Ophthalmology 1988;95(3):364-369. ↑ Lloyd MA, Sedlak T, Heuer DK, et al. Clinical experience with the single-plate Molteno implant in complicated glaucomas. Update of a pilot study. Ophthalmology 1992;99(5):679-687. ↑ Munoz M, Parrish RK. Prospective evaluation of extraocular motility following double-plate Molteno implantation. Arch Ophthalmol1999;117;1155-1160. ↑ Ventura MP, Vianna RN, Souza Filho JP, et al. Acquired Brown’s syndrome secondary to Ahmed valve implant for neovascular glaucoma. Eye 2005;19:230-232. ↑ Ayyala RS, Zurakowski D, Smith JA, et al. A clinical study of the Ahmed glaucoma valve implant in advanced glaucoma. Ophthalmology 1998;105:1968-1976. ↑ Nouri-Mahdavi K, Caprioli J. Evaluation of the hypertensive phase after insertion of the Ahmed glaucoma valve. Am J Ophthalmol 2003;136:1001-1008. ↑ Freedman J. Clinical Experience with the Molteno dual-chamber single-plate implant. Ophthalmic Surg 1992;23:238-241. ↑ Syed HM, Law SK, Nam SH, et al. Baerveldt-350 implant versus Ahmed valve for refractory glaucoma: a case-controlled comparison. J Glaucoma 2004;13:38-45. ↑ 53.0 53.1 Wang JC, See JL, Chew PT. Experience with the use of Baerveldt and Ahmed glaucoma drainage implants in an Asian population. Ophthalmology 2004;111:1383-1388. ↑ 54.0 54.1 54.2 54.3 Tsai JC, Johnson CC, Kammer JA, et al. The Ahmed shunt versus the Baerveldt shunt for refractory glaucoma II: longer-term outcomes from a single surgeon. Ophthalmology 2006;113:913-917. ↑ Budenz DL,Barton K, Feuer WJ, et al. Treatment outcomes in the Ahmed Baerveldt Comparison (ABC) Study after one yearof follow-up. Paper presented at: The 20th Annual American Glaucoma Society Meeting; March 4, 2010; Naples, FL. ↑ Barton K, Budenz DL, Gedde SJ, et al. Surgical complications in the Ahmed Baerveldt Comparison (ABC) Study during the first year of follow-up. Paper presented at: The 20th Annual American Glaucoma Society Meeting; March 5, 2010; Naples, FL. ↑ Al-Jazzaf AM, Netland PA, Charles S. Incidence and management of elevated intraocular pressure after silicone oil injection. J Glaucoma 2005;14:40-46. ↑ Ayyala RS, Pieroth L, Vinals AF, et al. Comparison of mitomycin C trabeculectomy, glaucoma drainage device implantation, and laser neodymium: YAG cyclophotocoagulation in the management of intractable glaucoma after penetrating keratoplasty. Ophthalmology 1998;105:1550-1556. ↑ 60.0 60.1 Englert JA, Freedman SF, Cox TA. The Ahmed valve in refractory pediatric glaucoma. Am J Ophthalmol 1999;127:34-42. ↑ 61.0 61.1 Budenz DL, Sakamoto D, Eliezer R, et al. Two-staged Baerveldt glaucoma implant for childhood glaucoma associated with Sturge-Weber syndrome. Ophthalmology 2000;107:2105-2110. ↑ Djodeyre MR, Calvo JP, Gomez JA. Clinical evaluation and risk factors of time to failure of Ahmed glaucoma valve implant in pediatric patients. Ophthalmology 2001;108:614-620. ↑ Wilson MR, Mendis U, Smith SD, et al. Ahmed glaucoma valve implant vs. trabeculectomy in the surgical treatment of glaucoma: A randomized clinical trial. Am J Ophthalmol 2000;130:267-273. ↑ Wilson MR, Mendis U, Paliwal A, et al. Long-term follow-up of primary glaucoma surgery with Ahmed glaucoma valve implant versus trabeculectomy. Am J Ophthalmol 2003;136:464-470. ↑ Gedde SJ, Schiffman JC, Feuer WJ, et al. Treatment outcomes in the tube versus trabeculectomy study after one year of follow-up. Am J Ophthalmol 2007;143:9-22. ↑ Gedde SJ, Herndon LW, Brandt JD, et al. Surgical complications in the tube versus trabeculectomy study during the first year follow-up. Am J Ophthalmol 2007;143:23-31. This page was last modified on March 9, 2018, at 15:45. This page has been accessed 201,114 times.